Pictured below is 22" Stevie playing with the Mini Baby Mobile, scroll down for more information. You can scarcely imagine my excitement when Secrist asked me to write an article on beads and pearls. Beading is my passion hobby! I add beads, pearls and other decoration to my newborn's clothes, whether I make the clothes myself or enhance bought items. I even personalize my own tee-shirts. Bead sizes are measured in a variety of ways, one of the most common being the numeric system written as 11/0 (pronounced as eleven-aught) for a small bead and 5/0 for a much larger one. A seed bead is a generic term to designate a tiny bead, like the 12/0 that Secrist carries. The larger the first number, the smaller the bead. The doll artist is faced with an embarrassment of choice when it comes to selecting beads to decorate a newborn or a reborn baby's outfit. The array of available beads and pearls staggers the imagination. Bugle beads, Charlotte beads, pressed glass beads, three-cuts, two-cuts, greasy beads (no, they are not actually greasy! ), satin beads, transparent beads are just a few of the varieties available. To help you cut through this maze, Secrist offers a basic selection of beads and pearls, as well as 5mm clear, elasticated thread. They also carry 6mm spring ring and crimp tubes to make necklaces. This is a good way for a beginner to add sparkle to your newborn or reborn clothing. When it comes to beads and pearls, many people think jewelry. Yet there are many other applications. For instance, to decorate a baby's cradle you can embroider Opaque E beads into a small picture [picture: On the farm]. The direction in which each bead is sewn creates texture in the embroidery. The tree in the picture has green beads running in different directions to give the illusion of foliage. A building would have all the beads running in the same direction for the walls and another direction for the roof. The addition of a few seed pearls or a fresh water pearl and a small string of pearls will transform a simple bow into a thing of elegance. In the same way, rhinestones or freshwater pearls glued onto a barrette will make an attractive and distinctive accessory. You can also make a scrunchy with a couple of small lustered bead strings. 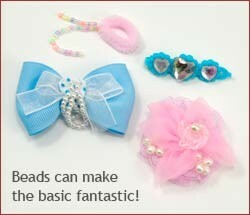 Or be bold and make a whole scrunchy with beads and pearls. The appearance of a baby's dress can dramatically be changed by a festoon of lustered beads along the hem or around the neck. A pretty variation is a string of seed pearls woven through ribbon lace. Rhinestones and pearls, either alone or in combination can make an interesting motif on a pocket, a dress or a boy's cowboy shirt. Pearls and beads can be knitted or crocheted into a garment [picture: Pearl crochet]. I like to string the pearls onto the clear elasticated thread which I then knit or crochet along with the yarn. Pearls or beads sewn in a circle or in a flower shape can put the finish touches to booties or a plain Mary-Jane shoes. For a day to day dress, boy's pants or a sweater, animal crackers are fun items to use. Beads and pearls can be more than embellishments for a garment. 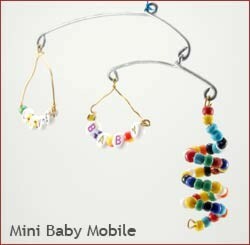 Simple mobiles hanging over a crib help to keep baby amused. 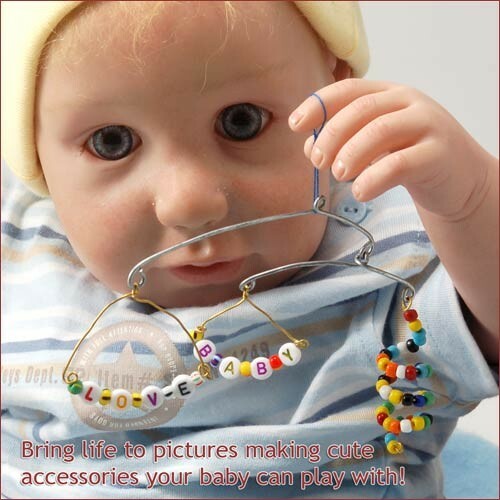 You can also usecube alpha beads, opaque E beads and striped beads, any beads or pearls can be used. 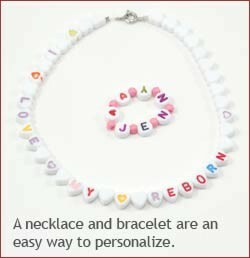 Since newborns and reborns are not likely to come to harm with a necklace, try a heart-shaped necklace and make a statement, such as "I love my reborns" or a bracelet with round alpha beads that spell out baby's name. And, why not an ankle bracelet? 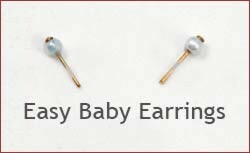 Baby earrings can be difficult to find at an affordable price. Make your own from a pair of 26mm (1 1/16") super fine lace pins. The brass head is small enough to be nearly invisible, but big enough that a seed pearl or a lustered bead will not fall off. A minute drop of super glue will hold the bead in place. Cut the pin quarter of an inch from the pearl. The decorative uses for pearls and beads is limited only by one's imagination. From a zipper pull to a baby bottle cover they change the ordinary into the attractively unique. So let your imagination soar and have fun! this article written by Vieve Montcombroux.